I might finish these tomorrow. If not tomorrow, then Thursday. At least that's the plan. I just need to finish their beaks and faces and do a little something with the background/border. That's a Keel-billed Toucan on the top, and a Toco Toucan on the bottom. In hindsight I maybe should have switched these around (since the left side is the more traditionally photographed side, but the Keel-billed is more colorful) but I put the Toco on the "front" because it's sort of the classic Toucan look that people are familiar with... I think. At any rate, I'm very happy with how it's coming along. I will do something with the background. Probably just some shading near the border like I did on the cheetah knife, but I'll see where things stand time-wise when I finish the birds themselves. Full-coverage leafiness would be super awesome, but would go way over budget. Work In Progress pics will resume tomorrow I think. There's work in progress, just not photographed. My old horse, Gwen (~24ish) came down with a tooth infection and some pretty funky nasal discharge about a week ago. The vet was out on Tuesday (the horses were due for routine vaccinations anyway) and said that Gwen would need to go in to the clinic for an extraction. Oh boy. So of course all week I'm thinking about Gwen, and what's in store, and how bad will it be, and how much will it cost, and she already has chronic foot pain and a bunch of other issues, and I already often wonder about her quality of life, etc etc. In other words, how far can treatment go before big heavy questions need to be asked. Right, fun stuff to think about. *sigh* But you have to make those decisions when you have animals. I hate to say this, but old animals are like old cars, little things keep falling apart and it gets very expensive to keep them running. But unlike cars, you have to take the animal's happiness into account too. I suppose old people are like that too. I don't want to get old. But that's another topic. Gwen went in to the vet clinic this afternoon, many thanks to Lisa D. for driving us there and back. She had two teeth pulled. One was infected and the other was loose. I am not looking forward to getting the bill. Gwen's life will change. She's not supposed to eat hay anymore, she won't be able to chew it up well enough to get the nutrients she will need, and she'd be likely to choke on it. She's on green pasture now, and that will continue to grow and feed her for a couple of months, and she gets a small quantity of senior feed as well to supplement her. And then it's going to be time to ask big questions again. Is she happy? How are her feet and other body parts holding up? Putting her on a special non-hay diet would eventually more than double her yearly feed cost, that's not something to take lightly. She would always have to be separated from Shylah, because she no longer pushes Shylah away from the feeder. Is it fair to her? Is it fair to me? I guess I have a few months to find the answers. And she at least has a few months to enjoy the sunshine and green grass. I hate this part of owning animals. My first horse, Thunder, was 24 when she died. To contrast them, Thunder had fabulous teeth. They got the pointy edges filed down every two years, but she was fat and sassy and eating hay at that age. Thunder foundered in May of 1999. She hung on until late July. She had actually seemed to be turning the corner and getting better when she suddenly got worse. It was nothing I did, that's just how founder goes, and in the end there was no question of what to with Thunder... the coffin bones in her front feet had dropped down to where they were touching the soles. She was in massive pain with no chance of recovery. In hindsight, sometimes I think I should have had her put down as soon as it happened, because her last two months of life were terrible. You just don't want to think about that stuff though. But I don't want Gwen's life to get terrible. Gwen foundered too, years ago, and also years before I bought her (which I didn't know when I bought her). Her feet have stabilized, but her bones did rotate, putting them closer to the sole than they should be. Rocks and rough terrain hurt her. Walking up hill hurts her. Sometimes cantering and even trotting seem to hurt. She's retired, so I never ask these things of her. Now there's teeth problems. And other problems too. So... we'll see how it goes in the next few months. And then late this afternoon I looked at all my young birds, which didn't take too long because there aren't all that many. A few months ago, I thought I had a lot of really promising youngsters. Boy did they disappoint me. There are some really hot stuff Black pullets, I must say. But aside from them, bleh. The cockerels over-all are terrible. I don't know why, just an off year I guess. I've mentioned in the past this huge problem of them not growing out their sickle feathers. It's worse this year. There are a bunch, in all colors, that never properly feathered out. I don't know if this is genetic (I do NOT keep these birds, I NEVER breed from a bird that doesn't have a full round tail! So why are there so many of them?!) or if it's nutrition or if it's just time of year. It seems a lot worse this year, and that was the latest I've ever hatched birds, so no more of that crap. I'm going back to the old schedule, and I'm setting up breeding pens next month. I'll hatch birds early, and sell eggs later if I can. Anyway, of all the cockerels that I had cooped up months ago (5 BBRed, 6 Black, 2 Blue, 2 Blue Brassy Back, 3 BBRedXBlack) I will keep 1 Black and 1 Blue. The rest have got to go, and most aren't worth shipping out as breeding stock. What a disappointment this year. 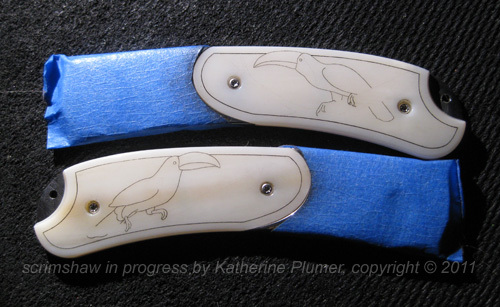 Okay, I've got less than a week to finish (um, start) my sales tax forms, and finish the Toucan knife. Taxes and Toucans. Whee. Sorry, I'm not exactly a barrel of laughs tonight am I.
Oh, right, and here's another crappy thing. The vet clinic I use is closing their large animal practice in a month, because there are apparently no longer enough large animals in the area to employ the vets. That's just freakin' sad. Perhaps I needed to clarify a little better, though I thought I explained pretty well... to be entered in the contest you needed to leave a comment on the original blog posting. Not in my email. Not on Facebook. So, to the several of you who tried to enter tonight on Facebook, I'm sorry. Gotta keep things fair, and that means only using names that were entered on the blog. 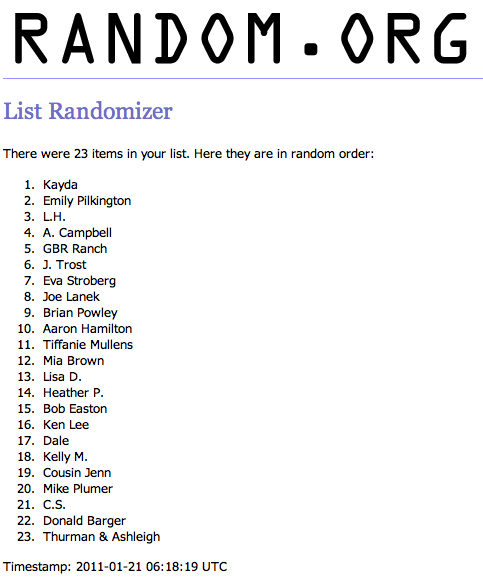 That said, you have no idea how suspenseful it is to put the names into the random generator and hit the button. OMG who's it going to be! Will the art leave the country? Will it even leave the county? Do I know the person? It's so exciting! Congratulations Kayda! My little drawing won't be traveling too far. I've known Kayda since high school, and we were roommates in college. She keeps saying she's going to commission portraits of her cats, so let's hope maybe having a teensy bit of my art on her walls will convince her that she needs to own more. ;-) Kayda, you know the drill, I need to hear from you by 10pm tomorrow so you can claim your prize. If you didn't win, well... there's always next time. This is fun, so I'm sure I'll give more stuff away. And... you know if you're really hankering for some art, you can always buy some. There are drawings for sale here and scrimshaw for sale here, and if you're going "eek I can't afford that" well then look over HERE where everything is priced ridiculously cheap. Seriously, I have nothing over $175 on there, so you can just go wild over there! My current project is to scrimshaw the scales (that's the knife-people-lingo for "handles") on this sweet little William Henry knife. It's really small. The scales are pre-ban walrus ivory. 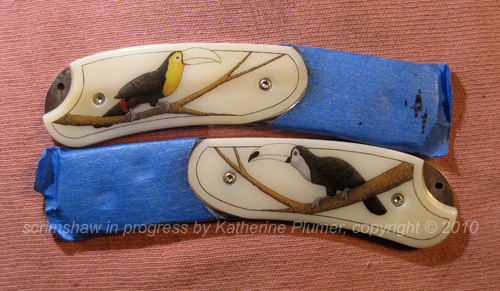 The subject matter is Toucans. They will be in full color. This is a subject matter I chose (and I had to fight for these guys!) because it's a perfect fit on this knife! It's going to look fabulous. 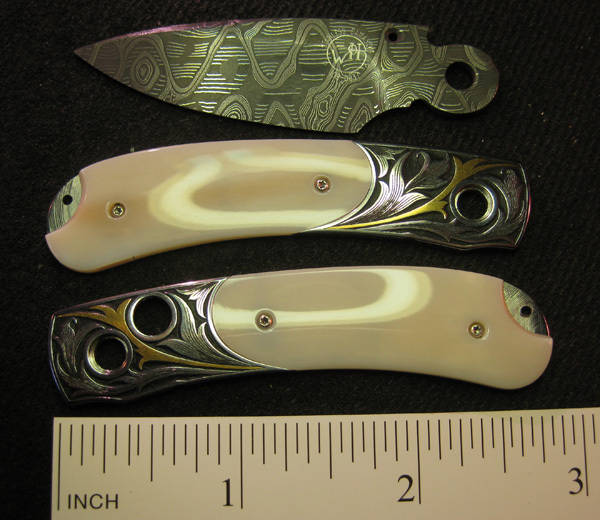 The knife is disassembled, but here's what the scales and blade looked like before I started. The microscope ring light is making a weird reflection, sorry. If you're really sentimental toward wild rodents, don't read this, because you'll probably hate me. If you hate the little vermin, enjoy! I used to equate rat infestations with poor management. And then rats moved in, and I realized that it's more about bad luck, because my management is just find. See, rats are pretty smart, and they figure out that a chicken coop is a great place to live. Food, water, not getting rained on, nice soft dirt to dig in, yeah! And I also think rats inherently know how to avoid getting killed. Unlike mice. Mice are stupid. I much prefer mice. Interestingly, when you have rats, you tend not to have mice. Though sometimes under really extra special conditions, you can get both. Conditions have been extra special lately. It had been several years since there had been a rat problem. Until recently. Now, I have to confess that I have some pretty mad skills when it comes to catching rodents. Like, catching, with my hands (and people wonder why I'm still single?). ;-) But rats are smart. And if the chicken coop has 5 individual pens, and they have built one hole in each pen, no matter how many bricks/logs/small boulders I stack on top of those holes while sticking the hose down the only open one, they still manage to use their super-rodent strength to elude me. It makes me gnash my teeth. Our former dog Jessie, bless her soul, would have caught, killed, and cooked the darn thing for dinner by now. She was the perfect assistant, I could leave one "escape route" open and know that should would handle that with aplomb. Angus is totally useless in this department, plus I don't quite trust his ID skills to differentiate a chicken from a rat in the heat of the moment. I don't like to put out poison, because I don't want the cats/dog/barn owls/kestrels/anything else to eat poisoned rodents. Besides, rats are smart enough not to eat it anyway. Unlike mice. Mice are stupid. I much prefer mice. And since it's IN the chicken coops, I can't really set a snap trap, unless I move all the birds out of one pen, but even at that I have this horrible fear of setting the big snap traps. How wimpy, right? I just value my fingers a lot. So my neighbors down the road a little bit were telling me about their electronic rat trap, in which they've caught 8 rats, 15 mice, and 1 cricket. Well sign me up! So after a lengthy and arduous trek here there and all over the dang county, I finally found one. They're not cheap, they cost about fifty bucks. I was so excited. I baited it right away, put it out in the chicken coop, and the next morning I had caught.... a mouse. I reset it, and the next morning the rat had dug a hole right next to it, rudely kicking dirt all over it in the process. I waited, and waited. Dejected, I read a little on line, and it said you're supposed to bait them but not set them for three days, so the rodents see it as a great little place to stop for lunch. Oops. See, the mouse was stupid. So I cleaned it out really well, lest there be any lingering smell of roasted mouse, put in fresh bait, didn't turn the trap on, and waited. And waited. It's been about a week and nothing but ants has any interest in the bait. Even though I put in fresh bait every other day. Peanut butter! Cheese! Cat food! Come on, how could a rodent turn that down! Probably because the rat, being infinitely smarter than the mouse, took one look at the fried mouse and said "oh h*** no, I'm not going in there!" and now it never will. So that one mouse, that one dumb little mouse, cost fifty bucks. I guess I'm going to have to pile up the bricks and boulders and logs and get the hose and dispatch this rat the old fashioned way. Maybe I can use the fancy shmancy trap on the next one that moves in. While I'm still wrestling with mammoth ivory (better, but not perfect, but it'll do, but OMG I don't even know how to start this image! ), and starting a ginormous sketch for a graphite drawing (holy wow, really does it have to be THAT big?) and desperately wishing that a client would pick one set of sketches over the other for the knife (it's a PERFECT image! Except it's not ferocious, but it fits SO beautifully!)... while I'm doing that, let's do something fun. I haven't given anything away for a while, and I've been frustrated and annoyed by the world lately, so I'd like to make someone happy. Making someone else happy makes me happy too. 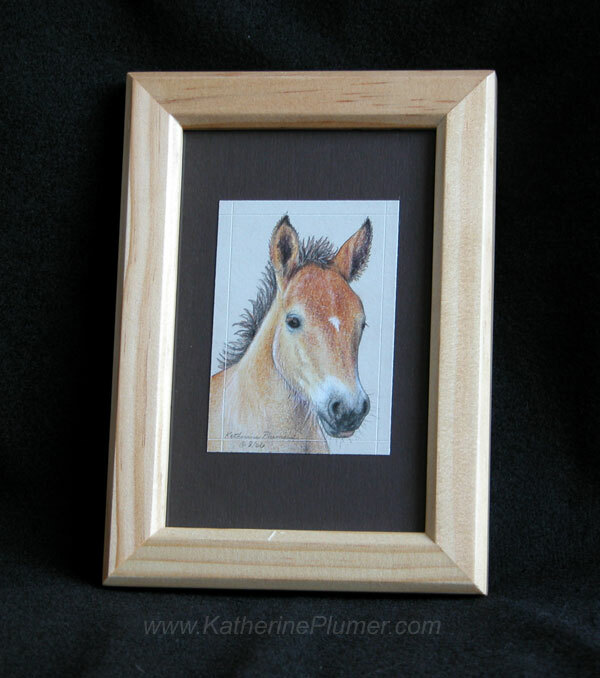 :-) So, up for grabs we have "Foal with Star," a tiny (2.5 by 3.5 inch) colored pencil and graphite drawing. It's framed, a whopping 4 by 6 inches. It has a wire and is ready to hang. Look at that little cutie! To enter, just leave a comment below and tell me why you want to win! Make sure you are identifiable. If you post under the anonymous category, sign your name or at least initials. No ID = not in the running for winning. I will put the names into random.org on Thursday January 20th, after 10pm and it will randomly select a winner. So you have until 10pm (pacific) Thursday to enter. The winner will be posted that night. The winner has until Friday January 21st at 10pm (pacific) to claim it, otherwise I re-pick. I'll ship it anywhere in the world via the USPS. If you don't like having things shipped via USPS, don't try to win it. I transferred an image onto that scrap of mammoth ivory that I was talking about the other day... the one that I had to saw down, the one that cracked, the one that turned out perfect anyway. Well darn it all to heck, it's being troublesome. It absorbs water. Noooooo!!!! This happened with the first piece of mammoth I ever scrimmed. The next several were fine. Here we go again. *sigh* So the surface got all ripply when I wiped off the ink. I have to wait overnight for it to shrink down as much as possible. I'll try a superglue top coat, which means I'm going to have to sand it and buff it again. #$@%!!!!!!!! If that doesn't keep it stable then I can't put this image on this piece, unless I use oil-based ink and make it a b/w image. But it was going to be SO COOL in color! And sooooo hard! Ugh. Well I'll see if I can seal it and go from there. And if anyone reading this is going to ask if I waxed it, yes I did, before I started. Didn't quite do the trick. In other news I got the knife in the mail yesterday, so I'm working on a design for that. I think I have something all sketched out that will look really cool and just barely squeak in at the upper end of the client budget, but I'd better sleep on it just in case I change my mind. I took 9 birds to Hollister (3 cockerels, 6 pullets). I also didn't manage to take any photos. Oops! Over-all they are on the young side, and really need another month or so before they are fully mature. Hopefully I'll be able to take more to Eureka next month. Hopefully more cockerels will turn out halfway decent. I was starting to be impressed with them but now I'm starting to be disappointed. I have this notion that I'd show up with a dozen showstopper BBRed cockerels. Hmmm, well... I'm going to be lucky if ONE turns out really good. Dang it. Anyway, people start talking about hatching this time of year, which makes me go "eeeek!" but really, I think I need to reconsider going back to my old hatching schedule this year. That is, start collecting eggs next month. Egads. Hatching in late summer has its good points (it allows me to sell eggs early in the season, it's easier to raise the chicks in brooders without needing lots of extra heat) but it also means that even by this time of year they are barely ready to show, and anything that I want to sell as a show/breeder bird has to kept over winter so I can see how it matures. That's a pain, I don't want any more birds in mud season than necessary! Soooo... maybe it's time to go back to the old way and hatch in the spring, and be done with it by late May or early June. I am planning to be in Atlanta again in June for Blade Show, but likely not going to be gone for 2+ weeks this time around, so it'll be a little easier for someone to take care of the babies. Besides, I have a feeling that late summer/early fall might be kinda busy, and I probably won't want to be dealing with babies late in the year. I need to go through all the birds again by the end of the month. There are more for auction, I'm sure. I should have a very very very limited number of show/breeder birds for sale. Again I'm going to need to focus on hatching BBReds. Maybe I'll even skip a year with the Blacks and the Brassies/Blue Brassies. I know that not showing Blacks will make me extremely uncompetitive, but that's not a top priority anymore anyway (much to the delight of a certain sebright exhibitor!). ;-) Or maybe I should just hatch a bunch of Blacks and kick some booty. Hmm. Oy, much to think about. Aaaannnd in other news... I mentioned this really awesomely beautiful scrim piece I have in the works. Well, working on being in the works.. I was asked about doing a custom pendant last month, and I sketched out two ideas for the potential client, one more simple and one very complex. Unfortunately by the time all the details got worked out it was too late to do it for Christmas. Whether it'll come up at a later date remains to be seen. The potential client had ultimately selected the more simple image, but I was left with the feeling that I HAVE TO scrim the more complex one. Because it's going to be awesome, and because it will be extremely hard, and I'm a sucker for that kind of thing apparently. I wanted to work on mammoth ivory. I don't have all that much on hand, but I picked out one really rough piece and spent a good while polishing that down. It's cool, but totally doesn't lend itself to what I want to do, it doesn't have the right look. So I picked out another small piece, which had a lot of brown coloration to it, so I'd have to cut off some of the "bark" to get into the whiter stuff. And here's where I have power-tool envy. About a third of the way through, I broke the blade on my little hand saw. Crap. So I rummaged around the barn... grinding it down was overpoweringly stinky (yes, I always wear a mask and goggles), the other small saw didn't cut it well. So I finally resorted to the 24" lumber saw. You know, the classic "saw" with the wood handle and the big toothy metal blade? All that, just to shave about a quarter of an inch off the face of scrap of ivory that was only about two square inches in size. Sheesh. It worked. But the ivory had a large crack in it. I was hoping it would hold, I'd even superglued the whole thing first. But it split. So... I was left with a piece that's about an inch by an inch and a half. Smaller than I wanted, but the more I looked at it, the more I see that it's perfect. The shape is perfect. A little bigger would have been nice, but this is okay. I know, you have no idea what I'm talking about. Because I didn't take any pictures yet. I'm expecting a knife in the mail any day. And when that gets here I'll drop everything and work on that anyway. 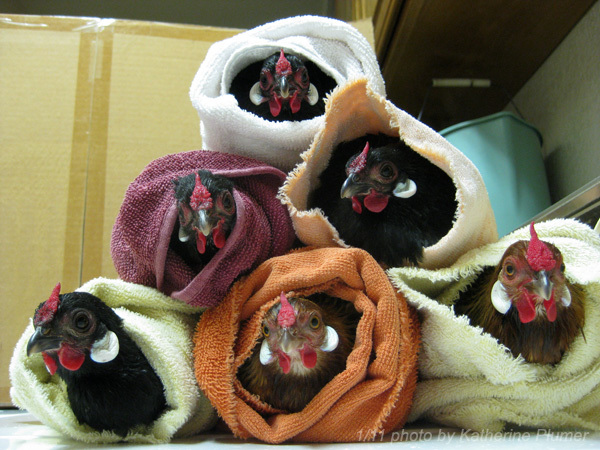 I have to wash chickens this week. I hope I remember how. I'll have to get up about 4am on Saturday, ewww. I drove all over the place looking for a particular type of rat trap today because stores told me they had it, and then when I arrived they were out of stock... would have been nice if they'd mentioned that on the telephone when I called. Sigh. I'm still looking. The cats and barn owls aren't keeping up with the rodent population. I am not pleased. New neighbors have moved in. I wonder if they've noticed the roosters crowing. At least it doesn't snow here. Maybe I'd like snow. Is it better than mud? By spring, I am going to be so dang tired of washing and wiping dog feet. The carpets have suffered mightily. I hung a bunch of paintings at Franklin Ranch Veterinary Hospital today. I still have a bunch of drawings at Silva's Sheldon Inn. 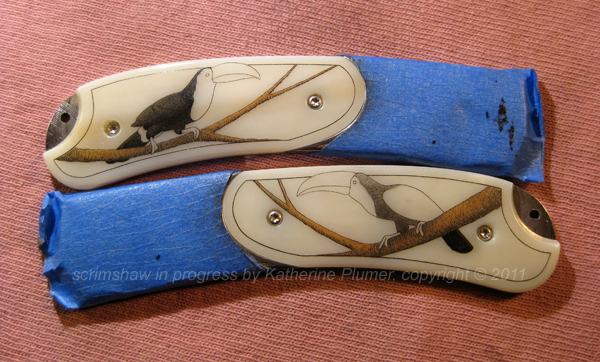 My next scrimshaw image is going to be awesomely beautiful if I can pull it off. The first challenge is turning a rough piece of ivory into something decent. I'm looking forward to going to Reno at the end of the month and hanging out with engravers. And I'm still not engraving metal! I'll catch hell for that, but you know what... that's okay. I just don't love it as much as scrimshaw. Maybe in time. Maybe not. I keep trying to enjoy it, and I enjoy the process but not the looks of the finished product. At least with scrimshaw you can see it from all angles! Recently I was reading some stuff I'd written about a year ago, and was struck by the things that didn't happen that I thought would happen. I actually thought the Standard would get finished and be available in 2010. Ho ho, no no. Early 2011, so I have heard. And I actually thought, a year ago, that by the time the book came out, I would no longer have my chickens. That was the plan, a year ago, to sell all but a few favorites, and I had every intention of doing that but when it came down to it, I knew I'd still be trying to breed good birds even if I just kept a few, and that would drive me batty if I didn't have a flock that was capable of producing anything. So I sold a lot of them, I think it was almost half the breeding flock, but I kept about 25 breeder birds. So yeah, I still have plenty of chickens. WAY less than I used to, but still more than I need or even want. I'm planning to attend three shows in January/February. I have no idea what I'll decide to do, bird-wise, after that. I still think I could be content to cut back to just the BBReds, but that means finding suitable buyers for all the rest, and that's always the sticky part. It's complicated. 2010 had some really good things going for it. I did some awesome stuff. Of course the two things that stand out the most are the cross-country drive to Georgia and back with Jan, and my trip to Wyoming to show my art. That's all pretty priceless stuff! If you *still* haven't seen the pics, they're linked in the right sidebar. I made new friends, I've seen new places, I've discovered how much I really LIKE long-distance driving, and I even caught myself looking at a map today wondering if I should do it again. Probably I won't, but I know that I could, and even that counts for something! Oh, 10, 9, 8, 7, 6, 5, 4, 3, 2, 1....... Happy New Year!!!!!!!!!! Wheeee!!!!!!!!!!!!! But let's be honest here, 2010 was a really tough year. I'm lucky and grateful to be in the situation I'm in, but there are so many people out there who are in dire straights and I hope things turn around in 2011. Do I have goals? Yup, and I'm going to write them down and stick them in a place where I will see them all the time. Sorry, not going to post them on line. There will be some big changes in the next year. :-) Keep an eye out here and I'll tell you all about it as the year unravels.